I was nervous about going to hospital this morning. It had been a long time coming, and many preparations had been put in place. Last night, I got ready my bag and the outfit I was going to wear, to help minimise the stress this morning. So many kind people sent supportive messages and best wishes. This morning I got up bright and early and went off to hospital – just not the one I had planned to go to, or for the reason I was nervous about. This morning was supposed to have been my first day back at work at a hospital in my neighbouring town. Martin, my other half had been complaining of back pain yesterday, which steadily worsened as the day progressed. Last night the pain worsened to the point where he was in agony, and he could barely move. The GP was considered but bearing in mind the level of pain and mobility, I thought A&E was best. As it turned out, it was a wise choice because he needed an x-ray (being an NHS Comms person who has worked on Choose Well campaigns, going to the right service for our needs is ingrained!). Thankfully, while Martin’s condition is very painful and uncomfortable, it is a nerve problem that is not serious. He has strong pain meds, and the option to return to hospital if the pain worsens. There is an irony to our hospital visit this morning. My return to work marks the end of a period of our lives that began with a visit to the same hospital back in February 2014. I left my desk thinking I would be away from work for a week’s leave. Martin and I had gone for a ‘babymoon’ at a posh hotel. It is there I started to feel unwell one night with the ‘heartburn’ I now know to be symptoms of the preeclampsia and HELLP syndrome. A few days later, I was sent to the local hospital by my community midwife. We hoped the hospital visit would be brief – perhaps having to return for multiple appointments until the end of my pregnancy. 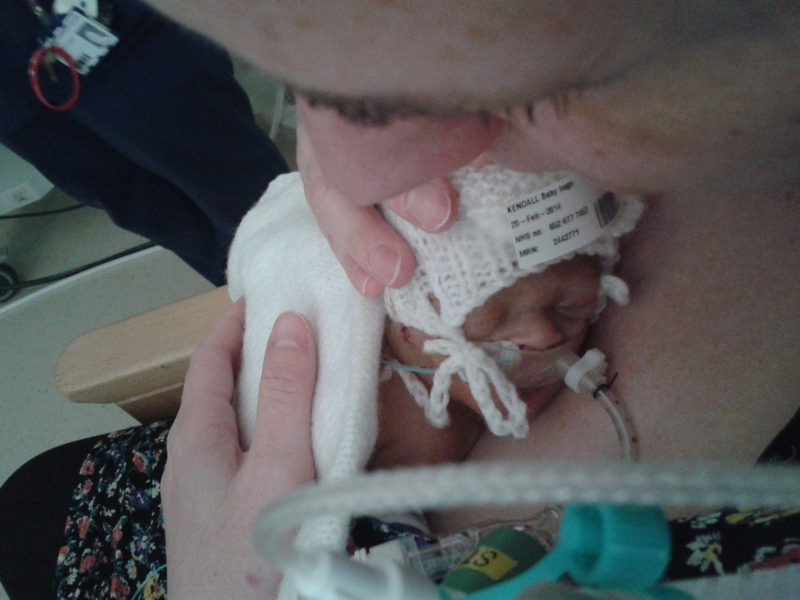 Not so – I was admitted, and sent to a specialist hospital two days later where our baby son was born 16 weeks prematurely to save both our lives. Since then, our lives have revolved around hospitals for one reason or another: the five weeks of Hugo’s life; debriefs with my obstetrician; tests to discover if there was a cause for HELLP syndrome; psychotherapy appointments. This has meant a return to work in a hospital is daunting – not only because the period of time that has elapsed – but also because it is in a hospital (even though it is not one I or Hugo were cared for in). Any hospital has so many triggers: smells, sounds, ambience. Thankfully on this occasion we were able to return home after a few hours, with none of the drama or action stations related to my own serious illness. I’ll be returning to work tomorrow instead. As a result of my illness and Hugo’s death things are very much in perspective for us: we understand what our priorities are. Our visit to A&E this morning underlined what Martin and I already know from the last 15 months: you never know what will happen tomorrow. Do you remember Sliding Doors, that Gwyneth Paltrow film from the 1990s? The film explored what happened to Gwynnie’s character – and her life – as a result of getting on the tube before the doors slid shut, or just missing the tube. Many of us have moments where we wonder ‘what if…’ for so many things. What if we had said ‘yes’ or ‘no’ to something we hadn’t or had done? What if we had turned left instead of right that day…the possibilities are infinite. In the vast majority of cases we can’t change what has happened, but that does not stop us wondering. – What if I had chosen a midwife appointment on the Thursday afternoon, rather than the Monday (Hugo was born on the Thursday morning)? Would Hugo have lived at all? Would I have died? – What if my condition had worsened on that Monday night, and Hugo had to be born at my local hospital. I probably would never have met him. The team at the local hospital would have done their best, but they were not specialists. Hugo would have had a long ambulance journey to a specialist hospital without me, with me following as soon as I was well enough. Being at opposite ends of the same hospital was bad enough. – What if Hugo had died before I had a chance to meet him? – What if Hugo had died without me being with him? – What if HELLP syndrome and preeclampsia happened a few weeks later in my pregnancy – would Hugo have survived, being bigger and stronger? – What if I hadn’t got ill at all, and went on to have a full-term healthy pregnancy? What would my life be like now, with an 11 month old baby? It would be amazing – but I find it difficult to picture. – What if I didn’t have so many wonderful, supportive people around me? – What if I didn’t have my blog to pour all my feelings out in, and to give me a purpose after everything that happened? – What if social media didn’t exist, and all the support that goes with it? – What if I had got the support I so badly needed sooner? These are just a small sample of my ‘what ifs’ and wonders. Different outcomes for some of them are terrifying, and do not bear thinking about. But I am human, and these thoughts come often unbidden. How I respond to them can depend on my mood, the nature of the thought, and the context. I try to not expend too much emotional energy on them. I try to acknowledge them, waft them away. I am very unlucky to have got a rare pregnancy complication, and at such an early stage. I cannot change what happened, I cannot bring Hugo back, no matter how much I wonder what would have happened if only it had happened a few weeks later. Or not at all. I try to remember that I am lucky to still be here. Physically unscathed. And I am lucky to have spent 35 precious days with my gorgeous little Hugo. Other women who had the same illness were not so lucky. I have many precious memories no one can ever take away from me.